Posted by mareserinitatis in Uncategorized. I was trying to find some math books at Barnes and Noble last night when I came across a book on needlework, of all things. 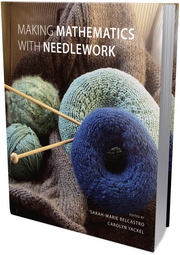 The book is titled “Making Mathematics With Needlework” and it’s edited by Sarah Marie-Belcastro and Carolyn Yackel. It has contributions of mathematically-oriented needwork developed by 8 contributors, all mathematicians. I’ve messed around a bit with hyperbolic crochet (although rather than making coral reefs, I’ve found they also make excellent dish-scrubbers when constructed from cotton). I’ve also been meaning to make a trilobite hat. Since I’m not a knitter, though, I would have to convert the pattern to crochet…which is what I spend most of my time doing looking at Thomasina’s Guide to Geeky Knitting. I opened the book and was hooked. (Ha!) The first sentence said, “Welcome to the first book to contain both mathematics papers and fiber arts project instructions.” The geek in me completely spazzed at this point. The book begins with an introduction containing an overview of the overlap of fiber arts and mathematics education. The introduction chapter also has a very nice list of references so you can learn more. There are a significant number of references that involve weaving, which doesn’t have a representative project in the book. After that, there are ten different projects. Each project has a lay description of the project and the math, the technical/mathematical description of the project, a discussion on how to include such a project when teaching math, and finally, the instructions for how to create the project. The project breakdown is as follows: six knitting, one crochet, one quilting, one sewing, one cross-stitch, and one embroidery. So the down side is that I wouldn’t probably invest in this book unless you are a knitter or crochet and are able to convert knitting patterns to crochet. One thing I found wonderful about the book is that, while I’ve had quite a bit of math, I’m not a mathematician and struggle reading math journal articles. However, I haven’t had any difficulty reading and understanding the technical sections of the projects. While the authors use mathematical notation and equations to describe the work, they keep it at a level that any scientifically literate person should be able to understand. That would be cool. I’ll have to see if my wife is interested. She’s long had a phobia of math, but she’s enjoying “fiber arts” [smile].